The ED is investigating over 3,700 cases of money laundering, involving tainted assets worth Rs 9,935 crore. NEW DELHI: The ED is investigating over 3,700 cases of money laundering and hawala transactions, involving tainted assets worth Rs 9,935 crore, as part of its action against black money generated post demonetisation, an official report today said. The central probe agency also carried out a "risk assessment" of these cases, registered post the note ban on November 8 last year, and found that a majority of (43 per cent) the financial crimes were carried out by perpetrating bank frauds and cheating financial institutions through a maze of shell firms. The other category of post-note ban financial crimes being probed by the Enforcement Directorate (ED) include cases of corruption (31 per cent), drugs and narcotics trade (6.5 per cent), arms and explosives (4.5 per cent) and others (8.5 per cent). "The head of this demon (of black money) is the money of corruption and illegal wealth acquired through banking frauds. "A general review of the cases post demonetisation show that businesses and professionals have collaborated with each other to use shell companies for converting illegal wealth into legitimate assets," the report said. ED Director Karnal Singh told PTI that the agency was "committed to work against the menace of black money and corruption and to bring professionalism in its working". The agency had registered and was probing a total of 3,758 cases (3,567 under forex laws and 191 under the anti- money laundering act), issued 777 show cause notices and attachment orders and has conducted 620 searches since November 8 last year to September. The total value of assets and forex violation amount involved in these cases stands at Rs 9,935 crore with the agency attaching assets worth Rs 5,335 crore under the Prevention of Money Laundering Act (PMLA) and issuing notices under the FEMA involving an amount of Rs 4,600 crore, the report said. The ED, that functions under the Union Finance Ministry, study also found that financial institutions like banks were the most "vulnerable" to money laundering crimes at 48 per cent followed by real estate at 35 per cent, precious metals like gold investments at 7 per cent and the rest 10 per cent in other sectors. The agency, that enforces the PMLA and the Foreign Exchange Management Act (FEMA) in the country, also arrested 54 people post demonetisation as part of these investigations. The ED found that the "proceeds of crime were laundered mainly through financial institutions (like banks) using shell companies and real estate". "Even in real estate sector the money for investments has been coming through financial institutions using a maze of shell companies. The shell companies, therefore, are the major modus operandi through which money is laundered," it said. The agency, according to official sources, had a number of politicians and bureaucrats under its scanner as part of these investigations. The probe in these cases involve scrutiny of voluminous paper documents and electronic records. Some of the cases require involvement of multiple agencies and the results would show sooner than later, they added. The agency has also chronicled the various methods used to launder black funds like conversion of stash funds with the help of bank officials, hiring services of professionals like chartered Accountants, investment in gold, bullion and jewellery and advance remittances against imports. The other most noted money laundering techniques used post demonetisation involved investment of tainted assets in foreign currency, real estate and benami assets, the report said. 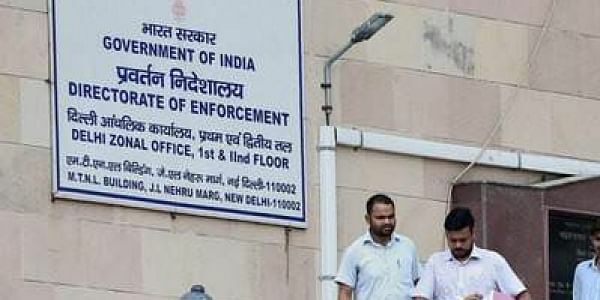 The ED had conducted country-wide searches against shell firms early this year and sources said more action against their beneficiaries and operatives would take place in the coming days. "Most of these firms have dummy directors. They sign balance sheets and other documents on the instructions of the operators (called entry operators). Many such firms are either registered at fictitious addresses or at one-room locations," the report added.